Tobias SutterThings that are true about live music rooms in Toronto: 1) Everyone hates the Sound Academy, for reasons that don’t really need to be expounded on; 2) a lot of people hate The Phoenix when it represents a tipping point for ascendant acts moving out of clubs and into bigger rooms; 3) a lot of people love The Phoenix when it offers a relatively intimate setting for who might normally play larger rooms but for whatever reason – choice or circumstance – are downsizing. It’s that third category that I was front of mind yesterday as a batch of concert announcements rolled in. 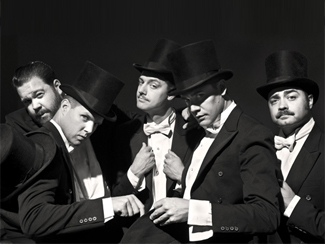 Already scheduled for two dates at The Air Canada Centre supporting Pink on November 30 and December 2, Swedish garage rock heroes The Hives have decided days off are for chumps and have scheduled their own show at The Phoenix for December 1, tickets $29.50. Their last headlining show in support of last year’s Lex Hives was in July 2012 and at The Sound Academy, so their playing a room one-third the size is rather a boon for their fans, at least those who didn’t rush out to buy Pink tickets to see them. Which I would think would include all of them. New Zealand electro-poppers The Naked & Famous, on the other hand, may be finding out that they’re neither sufficiently naked or famous to fill the Sound Academy as they’ve downgraded their October 14 show in support of their just-released second album In Rolling Waves from there to The Phoenix. Playing the room wasn’t overreaching as their last show in support of their hit debut Passive Me, Aggressive You was there and was their fourth local performance in a year, no less, but kids these days have short attention spans. Remaining tickets for the show are $28.50 in advance. BBC has an interview with the band as does Noisey, along with a stream of the new record. When British soul singer Jessie Ware made her local debut at The Opera House in April, it seemed a foregone conclusion that her next visit would be in a much bigger room. And while I won’t suggest that her upwards trajectory has stalled – she and Devotion are just too good to be denied – I was surprised to see that her November 6 show at The Sound Academy had also been downsized to The Phoenix. On the plus side, I already know a few people for whom this show has gone from “ugh” to “ooh”, so it should still be a good and full house when she and The Invisible return to town. Whatever tickets remain for that one are $25 in advance. Interestingly, one of her New York shows on this tour was also downsized from a 3000+ room to a 1000 but a Brooklyn show was also added, so maybe this is as much about the experience as soft sales. Or not. Anyways, if you were on the fence then it’s time to get to a ticket outlet. The Rural Alberta Advantage have been fairly quiet of late, presumably working on a follow-up to 2011’s Departing – their last local show was last Fall with Dan Mangan at The Danforth Music Hall – but they’ll be taking the stage at the Adelaide Music Hall on October 18 as part of Indie Week, which is apparently a thing. You can get in with a festival wristband or paying $25 for an advance ticket. Widowspeak fans dismayed that their only opportunity to see them this Fall was as support for Iron & Wine at The Sound Academy – that place again! – on September 28 will be pleased to know that they’ll be back soon enough in support of their new EP The Swamps, out October 29, for a show at The Silver Dollar on November 2 with Pure Bathing Culture and tickets running a very reasonable $12.50. Baltimore’s Future Islands haven’t announced anything about a follow-up to 2011’s On The Water, but they’re still hitting the road and will be at The Drake Underground on November 10, tickets $15.50. At some point, the release of Illinois roots-pop artist Lissie’s second album got pushed back a few weeks, but they’ve now committed to both an October 8 street date for Back To Forever as well as a Fall tour to support it. Ms Maurus will be at the Adelaide Music Hall on November 21, tickets for the show $22.50 in advance. They may not have been crowned Polaris champs on Monday night, but Young Galaxy can still announce themselves as 2013 shortlisters when they take the stage at The Hoxton on November 22. Not that they would or should; that’s kind of gauche. Tickets for that one are $18 in advance. If you missed fantastical Swedish synth-pop duo The Deer Tracks when they were here in March – and mathematically, most all of you did – then you can rectify that when they bring their opus The Archer Trilogy back to North America for a victory lap. They’ll be back at The Silver Dollar on November 28. His Toronto debut a couple weeks ago having completely sold out even after being upgraded from The Drake to Wrongbar, Archy Marshall – aka King Krule – will bring his album Six Feet Beneath The Moon back as part of a larger tour and will be at Lee’s Palace on December 9, tickets $20. The New York Times has a feature piece on the artist. Interview, MTV, and Rolling Stone have features on Swedish electro-pop sensations Icona Pop, whose North American debut This Is… Icona Pop is out this week. MTV Hive, Elle, and Interview chat with Nanna Øland Fabricius of Oh Land, whose new album Wish Bone is also out this week and is available to stream courtesy of The Line Of Best Fit. Esquire also has a video session with the artist, who plays The Great Hall on September 30. The New Strait Times, South China Morning Post, and Electronic Musician have interviews with Icelandic composer Ólafur Arnalds. Le Blogotheque serves up an Empty Spaces session with Sigur Rós filmed in the catacombs of Paris. A Heart Is A Spade interviews Kate Boy. Frank YangThe nice thing about having written about Swedish duo The Deer Tracks at length over over the past ten months is that rather than bother with any preamble, I can just point you to those past pieces and get right to it. I honestly hadn’t expected them to return to town so soon after NXNE last year, not because they didn’t want to but because of the economic realities of small international acts trying to tour this continent. But with the final instalment of their Archer Trilogy just out and an appearance at SXSW confirmed, they put together a massive tour that brought them back to Toronto for a show at The Silver Dollar on Thursday night. As with last time, the core duo of David Lehnberg and Elin Lindfors were augmented live by a drummer and keyboardist, and the band as a unit were able to introduce a new dimension of improvisation and urgency to the songs while maintaining the drum-tight arrangements of the electronically-inclined recorded versions. Unlike last Summer, Lehnberg left the guitar at home this time out and played exclusively keys, with Lindfors playing more musical saw along with her melodica, glockenspiel, and percussion duties. And oh yes, they both sang – beautifully, emotively, and with a commitment to the performance and material that you don’t realize is rare until you actually witness it for real. Their set, a cherry-picked condensed version of the whole of The Archer Trilogy yet still feeling remarkably cohesive with a definite arc, clocked in at under an hour – considerably more than we got at their NXNE showcase, but still feeling too short. In some perfect world, there would be the opportunity to see them perform their Trilogy front to back with the sort of production and presentation you know that Lehnberg and Lindfors see in their mind’s eye, but for now I will be thankful they’ve come around as much as they have and hope it happens again. The Deer Tracks just released a new video from The Archer Trilogy, Pt. 3 for “Divine Light”. The Chicago Tribune talks to Søen Løkke Juul of Indians, performing tonight at The Drake Underground. PopMatters goes all in on The Mary Onettes, offering an interview with the band and a stream of their new album Hit The Waves ahead of its March 19 release date. The Quietus has a track-by-track walkthrough of the album by the band. There’s a fair bit of interesting Scandinavian representation at this year’s Canadian Musicfest, but frustratingly a lot of it is in scheduling conflict with other things I want to see. Happily, Queen West music shop Moog Audio is throwing their hat in the festival in-store ring by hosting, in conjunction with Nordic By Nature and Swede + Sour, a triple-bill featuring Iceland’s Sóley, Norway’s Sandra Kolstad, and Sweden’s This Is Head, on the evening of March 21 from 6:30PM to 8:00PM. And then you can zip up to The Mod Club to see Efterklang and complete your Nordic band bingo card. Or maybe that should be “bíngö”. Also, note that the Kolstad video is tastefully but definitely NSFW. And speaking of Efterklang, NPR has a piece on the band and how they turned an abandoned Russian town into their studio for Piramida. As mentioned, they headline The Mod Club on March 21 for Canadian Musicfest. The Straits Times and Echoes & Dust talk to Ólafur Arnalds about his new record For Now I Am Winter, out in North America on April 2. The Oxford Times have an interview with Nanna Bryndís Hilmarsd&ocaute;ttir of Of Monsters & Men, who are back in town on May 25 as part of a massive North American tour. The venue and ticket details are still to come, and maybe it’s wishful think, but the way the “TBA” is phrased, I get the sense that their show is part of something bigger. HMM. Vice and Drowned In Sound talk to Copenhagen’s Iceage, who will be in town for NXNE this year for at least a couple shows on June 15 and 16. And while it’s pure speculation at this point, it’s hard not to look at this and then this, consider this and figure that even if she stops to do some antiquing, Björk will have more than enough time in those six days to make her first visit to Toronto since this. Or at least one would hope. Neil KrugOn any given night, in this great city of Toronto, you’ve got no shortage of entertainment options vying for your evenings and dollars, but sometimes there occurs a confluence that simultaneously reminds you of how lucky we are as well as how unfair the universe can be. Case in point, this coming March 4, when the equivalent of a Pitchfork Festival sidestage will descend on Parkdale across two venues, and while you can try to club-hop, realistic logistics will probably force you to make some hard choices. Over at Wrongbar, you’ve got: Kiwi-American acid-pop outfit Unknown Mortal Orchestra, touring behind their new album II; Los Angeles psych-folk duo Foxygen, whose debut We Are The 21st Century Ambassadors Of Peace And Magic is drawing raves; and Portland’s electro-pop duo Wampire, readying their debut Curiosity for release in May. And just east, across the great Dufferin divide, The Drake Underground hosts the Nashville-based timeless Americana of Night Beds and their debut Country Sleep, and all the way from Copenhagen, Søen Løkke Juul – aka Indians – and his debut album of atmospheric pop, Somewhere Else. Tough decisions, yes, and I’m here to make those decisions easier/harder. 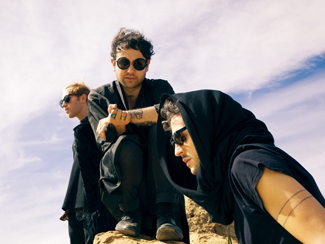 Tickets for the UMO/Foxygen/Wampire show are $13.50 in advance and Night Beds/Indians goes for $12, but courtesy of Embrace I’ve got two pairs of passes to each to give away. To enter, email me at contests AT chromewaves.net with either “I want to see UMO” or “I want to see Night Beds” in the subject line and your full name in the body, as well as which of the two shows you’d prefer should you enter both. Which you can do if you like. Contest closes at midnight, February 27. Austinist has an interview with UMO principal Ruban Nielson; NPR has a World Cafe session with Foxygen; The Guardian makes Wampire their New Band Of The Day; MTV Hive, Gigwise, and American Songwriter talk to Night Beds frontman Winston Yellen; and Indians are profiled by The San Francisco Examiner, The Georgia Straight, and MTV Hive. Jon ShardIt’s been a while since both Morrissey and Johnny Marr have been in the news simultaneously, and not just issuing denials of Smiths reunions. Moz, unfortunately, is making headlines for his health issues and resulting tour cancellations – though that’s probably better than for making outrageously offensive comments – but Marr’s press cycle is decidedly more positive as he’s now just a week out from the release of his new record The Messenger. It’s not entirely clear to me why The Messenger is being called his solo debut; even though 2003’s Boomslang was credited to Johnny Marr & The Healers, I don’t think anyone looked at it as a songwriting partnership between Marr and Zak Starkey. Of course, the fact that that record wasn’t very good may play a part in why they’d rather present The Messenger as its own standalone thing rather than a follow-up. In any case, with the February 26 release date of the new record almost upon us, the whole of it is now available for advance stream at Rolling Stone. I’m not sure what general expectations around the record are. 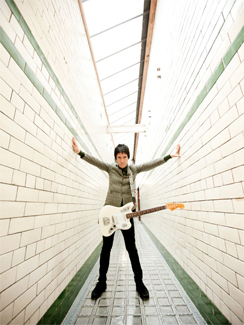 It’s great to have Marr and his guitar back and not just playing sideman, even though that’s the role through which his legend was largely formed. For my part, I just wanted it to be better than Boomslang which was disappointingly lacking in personality and sounded like a late-era Britpop also-ran. The Messenger feels sprightlier, more melodic, and more classically Marr – more jangle than riff. Whereas I couldn’t wait for Boomslang to be over, I’ve been hitting repeat on The Messenger – consider it endorsed? Pitchfork, Clash, and Time have interviews with Marr and NME got him to play “Heaven Knows I’m Miserable Know” for the first time in a quarter-century by way of a guitar lesson. Marr’s North American tour – backed by The Healers but not the same Boomslang Healers – kicks off in April and will stop in Toronto at The Phoenix on April 27. The Sun, The Guardian, and eMusic have features on Nick Cave & The Bad Seeds on the occasion of the release of Push The Sky Away today. They play Massey Hall on March 23. The Fly interviews Iceage. Their new album You’re Nothing is out today. Esquire has an interview with Thom Yorke, usually of Radiohead but lately of Atoms For Peace. Yorke and his AFP compatriots hosted a Reddit AMA yesterday in advance of the release of AMOK on February 26, and have also begun streaming the new album in whole at NPR. Oh, and if a Thom Yorke-Flea collaboration doesn’t float your boat, know that Radiohead will be reconvening this year to work on a new album. NPR is streaming Shout Out Louds’ latest effort Optica ahead of its February 26 release date. They play The Opera House on May 14. The Line Of Best Fit interviews Søen Løkke Juul of Indians, who are at The Drake on March 5. The Independent talks to Kate Nash about her third album Girl Talk, due out on March 5. 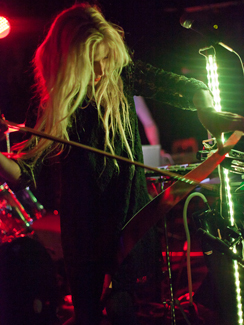 She plays The Horseshoe on March 15. For Folks Sake talks to Stornoway about their second album Tales From Terra Firma, coming March 19. They’ve just released the first video from the album. Clash interviews The Joy Formidable about their new record Wolf’s Law, which they bring to The Phoenix on April 12. Phoenix have premiered the first sample of Bankrupt! at Pitchfork by way of lyric video, and yes it sounds like Phoenix. Bankrupt! is out April 22. Primal Scream have released the first video from their new record More Light, which is due out on May 6. The Line Of Best Fit talks to Foals, in town at The Kool Haus on May 11. Though there’s maddeningly no word on an actual full-length release, Kate Jackson – ex-Long Blondes – has made the whole of her recording sessions with Bernard Butler available to stream. Which will have to suffice for the foreseeable future. 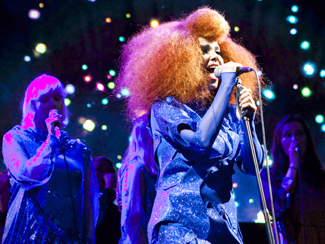 NPR welcomes Bat For Lashes for a World Cafe session.